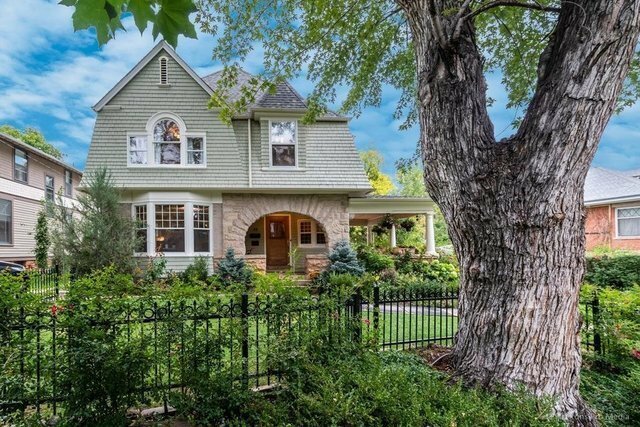 This historic Mapleton Hill home proudly sits on a slight rise above blooming gardens and a seasonal irrigation canal. A stone archway frames the welcoming wraparound porch – an ideal spot to enjoy the shade, a beverage, and a wave to your neighbors walking to Pearl Street or the trails just a few blocks away. The porch sets the stage for the magnificent entry with oak woodwork, bowed windows and a curved window seat.The main level features a formal living room with bay and bowed windows and a wood-burning fireplace; a formal dining room with a bay window; a comfortable den with a second fireplace and French doors opening to the wraparound porch; a family room with garden views and French doors opening to the back deck. The updated eat-in kitchen offers a large butcher block island with Wolf, Thermador and Bosch appliances. The second story features four bedrooms including the private master. Daylight and fresh air stream through generous windows on three sides of the updated master suite. The well-appointed and timeless master bathroom features double vanities, a claw foot tub and steam shower. The open beamed and sky lit third story, with its private full bathroom, works well as a fifth bedroom, home office, or a quiet space to relax.At the rear of the site is the charming carriage house. The yard is picturesque and peaceful, with seasonal running water, lush gardens, shaded patios, and lawns to play and relax.Additional features and stats: Year Built – 1902 Lot size – 11,390 square feet Total square feet: 5,341 - including 249 square feet carriage house Taxes - $19,169 Schools – Whittier, Casey, Boulder High Five bedrooms, five bathrooms Water rights from adjacent irrigation ditch.